Why is it that the best stories are the hardest to write? When nothing big happens, the words flow easily. When I spend twelve days in a continual state of “I-can’t-believe-how-lucky-I-am-to-be-here,” I don’t know where to begin to write about it. Such was the case with my trip to Bhutan last week. Far beyond a travel adventure, this trip had meaning and importance more than I can even begin to understand or convey in a blog post. The only thing I can think to do is to write it in a series; like an artichoke with a few tasty morsels on the outside to be greedily consumed before picking my way through the fibrous, unpalatable layer to eventually reveal the sweet essence hidden deep within. Touching down at Paro airport after a night spent in Bangkok, Pip, a Christian contemplative from New Zealand who had spent time as a Buddhist nun in Thailand, mom and I navigated our way through customs and were greeted on the other side by our hosts; Lopen Gembo Dorji, Secretary General of the Monastic Body of Bhutan, and Sabina, an American woman living in the UK who had been our primary contact in the logistical planning of the trip. Erik, an intense young American Christian studying at Naropa Univeristy in Boulder, and Oswin, a Christian monk from Mirfiled, UK with a specific interest in Japanese art rounded out our group. We were a somewhat unlikely “delegation,” spanning a thirty year age range and with varying degrees of wisdom and practice, but with an unrivaled earnestness and sense of gratitude for whatever stars had aligned to bring us together for this experience. Our host Gembo had attended secular school though university and then became a monk, an unusual trajectory, as most choose one path or the other much earlier in life. Once he became a monk he did a three-year retreat and lived alone in deep practice in the mountains for years before being beckoned back to service by the central monastic body. Gembo is fluent in English, politics, economics, history, religion, culture, philosophy, and has a particular gift for story telling and teaching. While he expertly serves with grace and skill, his heart is in his practice. Gembo is one of the most extraordinary people I have ever met. The awe-factor continued with Gembo’s co-host. The woman I knew by email as our coordinator, Sabina Alkire, turned out to be a hero in my book, and the same age as me. Founding director of the Oxford Poverty and Human Development Initiative, a PhD economist and ordained Anglican priest, Sabina is the protégé of Nobel Prize winning Indian poverty expert Amartya Sen, and is also the economist behind the measurement of GNH in Bhutan among other things. With this resume, one might expect a formidable presence, and yet Sabina treads lightly in all that she does, gracefully and humbly leading our group with an artistic skill that was a delight to experience and an inspiration. 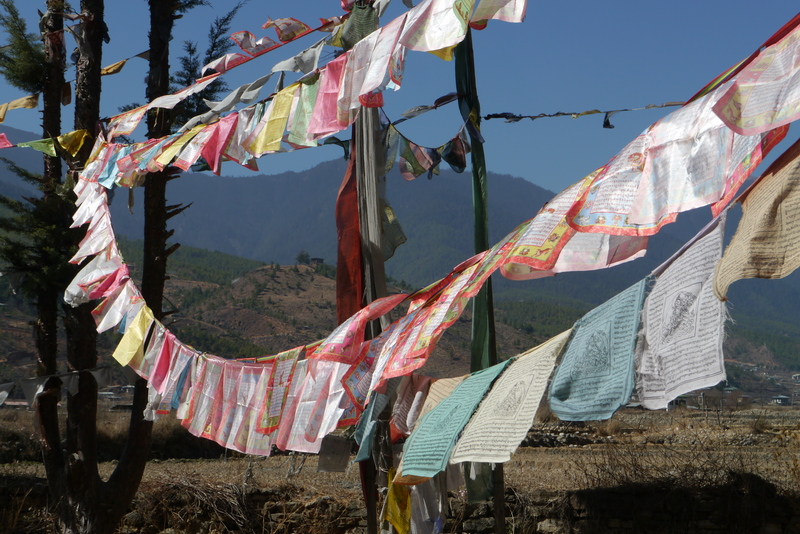 Gembo and Sabina created an 11-day itinerary for our group that would cover three towns on the West side of the country, Paro, Thimpu and Punakha. 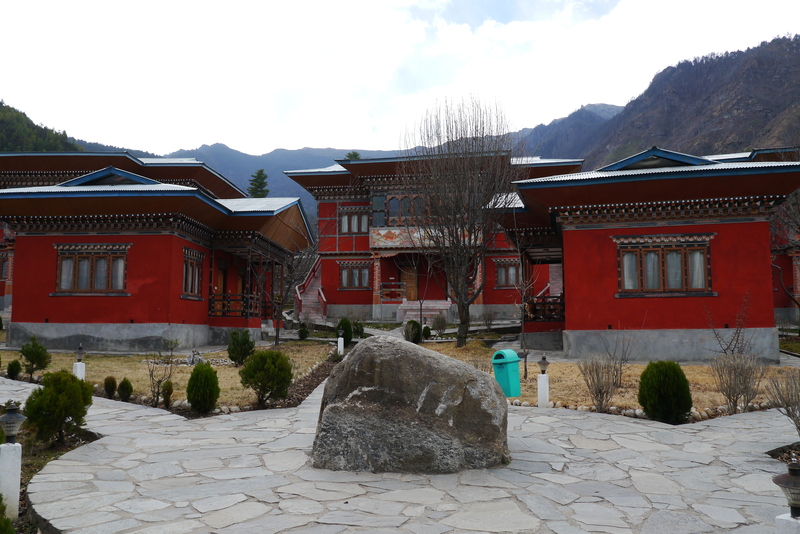 Our schedule listed meetings with senior members of the monastic body including three of the five Eminences, Dasho Karma Ura, the architect of GNH and Director of the Center of Bhutan Studies, and two vice principals of monastic schools. Everywhere we went we were welcomed into the private chambers of the temples and monastic schools, served tea, biscuits and roasted rice by monks, and treated like honored guests. Modernization in Bhutan has come fast. Mobile phones were introduced only a decade ago and are now ubiquitous. 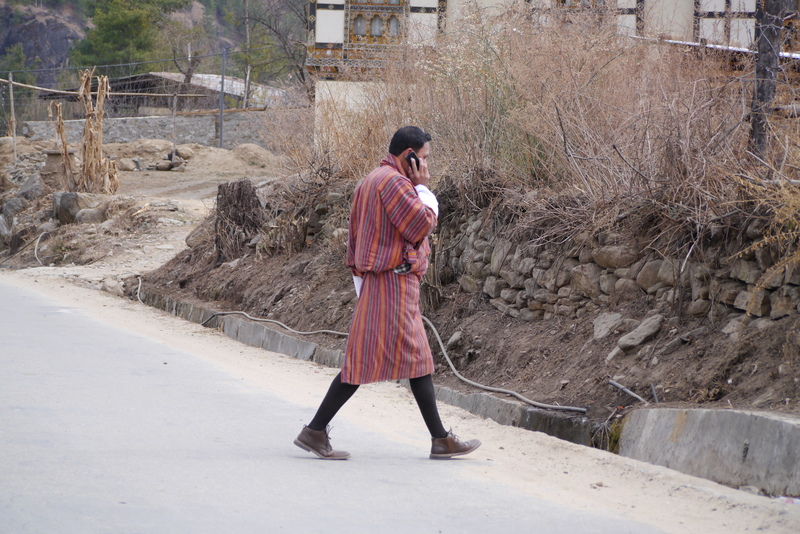 Even the monks carry and answer mobile phones all the time. It was a regular occurrence to hear cell phones chime in the temples, and there seemed to be no particular concern about it. While Wi-Fi for tourists is still mostly accessible at Internet cafes and international hotels (I went three days without checking email), the insidious attraction of constant connectivity and electronic entertainment has not spared this small kingdom. English usage is spreading too. Secular schools are now taught in English while the monastic schools continue to be taught in the traditional Dzongkha. Television and radio are widespread, with mostly Indian content on the TV. This is a rapidly modernizing country, but with a desire to do so consciously. Our first night was spent in a guesthouse outside of Paro with a view of the majestic Taktshang Monastery, Bhutan’s most famous attraction more commonly known as the Tiger’s Nest built on the edge of a cliff. We would later return to Taktshang on our final day in Bhutan to make the ascent once our bodies had acclimatized to the altitude. Our accommodations were simple, but perfectly located. As we prepared for our first meal together, I eyed my almonds and granola bars, reasoning I could supplement after the meal. I had done Internet research on food in Bhutan and found a series of drab photos of grey food, mostly chilies in cheese sauce and red rice. To my delight, I found these to be woefully outdated. The food in Bhutan is delicious! A few years ago people discovered a taste for fresh fruits and vegetables and began growing them in the off-season in and around the beautiful rice terraces. With clean Himalayan water and good rich soil these plants grow plentifully. Every meal we ate in Bhutan included vegetables as well as some local favorite dishes like eze – chilies, onions, tomatoes & cheese — and the delicious emadatse – hot chilies and cheese. There was nothing gray to be found ever. I returned to HK missing the food in Bhutan. 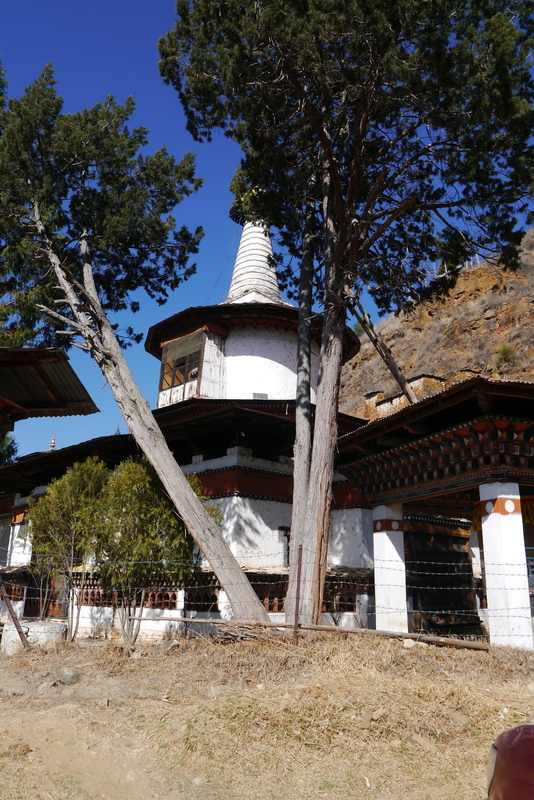 The first temple we visited, Kechu Lhakhang, was built in 651 AD. Visiting a temple has a very specific routine we learned. Remove shoes and step over the entrance into the temple. Facing the statues, bow three times, hands in prayer over head, in front of face, in front of chest, and then lower to the floor and touch one’s head to ground, then return to standing and repeating two more times. Next, rest an offering gently to one’s forehead, say a prayer and place the bill on the altar. If a monk caretaker is present, a small drop of saffron-infused water is poured from a beautiful peacock feather adorned pitcher into the palm of one’s hand. Drink it, or place it on the back of your head. We repeated this ritual at each temple we visited. On our way to Thimpu the next day, we visited Dungtse Lhakhang, a chorten-shaped temple built by the famed iron bridge builder Thangtong Gyelpo in the 15th century. Inside the mandala inspired temple we scaled smooth ladders in the darkness up to the very top level. With flashlights and some small electric light bulbs we marveled at exquisite detailed paintings depicting dharmakaya, sambhogakaya and nirmonakaya. Gembo was a walking encyclopedia of Bhutan history, Drukpa Kargyu and Vajrayama, and could identify and tell us the meaning of every image we saw. Avalokiteshvara, Guru Rinpoche, Mahakala, the divine madman, chakra sambala, bodhicita, tantra… these words swam in my mind as I tried to capture what I could. I was wishing I had studied more before I went. 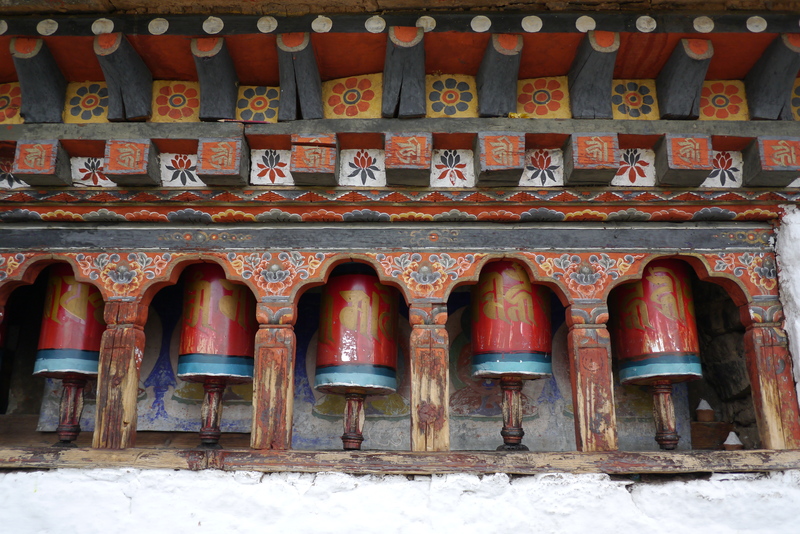 On our way out, circling the temple clockwise and turning the prayer wheels as we went, I was amused to see the young caretaker family share a coke and a smile. Bhutan is glorious countryside. As part of their effort at conscientious modernization they have protected 70% of the land, most of which is national parkland. Bhutan’s economy is supported by hydroelectric power it sells to India, special cordyceps (a medicinal “caterpillar fungi” popular in Chinese medicine) sold mostly to China, agriculture, and high-end tourism. Bhutan’s relations are closely tied to India and not at all to China. Even the national currency, the Ngultrum, is tied to the Indian rupee. On the two-hour drive from Paro to the capital city of Thimpu, we snaked along, high above a river on a bumpy two-lane road reminiscent of the last 15 miles into Telluride that regularly gets cut off by mudslides, marveling that this was one of the “highways” in the country. The story will continue in the next post. Stay tuned..